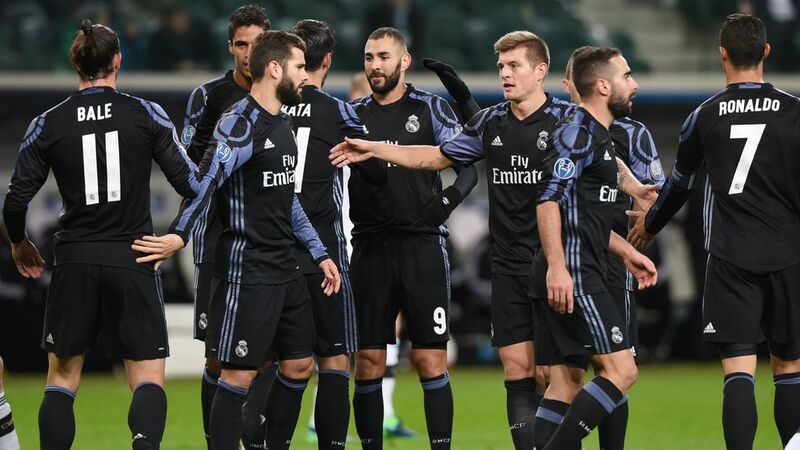 Group F stragglers Legia Warszawa came from two down to the verge of a famous victory, before a late Real Madrid equaliser forced them to settle for a 3-3 draw. Legia Warsaw became the first Polish team to take a point off Real Madrid in the Champions League as they drew 3-3 behind closed doors at the Polish Army Stadium. The thrilling contest was witnessed by only around 1,000 people in the ground after UEFA imposed a stadium ban on Legia following crowd disturbances in the game with Borussia Dortmund. Real, who had won all seven of their prior meetings with Polish opposition in this competition, had gone 2-0 ahead as Gareth Bale marked his new contract with a goal and assist for Karim Benzema. But the hosts fought back through Vadis Odjidja-Ofoe, Miroslav Radovic and Thibault Moulin and were on course for a memorable victory until Mateo Kovacic salvaged a point with five minutes remaining. Real's fastest ever Champions League goal arrived just before the first minute was up as Bale displayed exquisite technique for the opener. Fabio Coentrao's left-wing cross was headed on by Cristiano Ronaldo and the ball bounced once before Bale twisted his body and dispatched it into the top corner with a knee-high half volley. Zinedine Zidane's side were certainly on top and Raphael Varane, Bale and Ronaldo all came close from corners while Benzema drew Arkadiusz Malarz into a decent stop. Benzema would not be denied in the 35th minute as he placed a first-time finish into the top corner after Bale had reached Kovacic's pass to set up the Frenchman. As good as Real looked going forward, they were giving Legia openings at the back and Odjidja-Ofoe, who played just 10 times in two seasons with Norwich and spent a short period on loan at Rotherham, pulled one goal back before half-time by firing in off the post from the edge of the box. The hosts then levelled before the hour mark through Radovic as he drove past Bale and Kovacic and unleashed a toe poke from distance which somehow squirmed under Keylor Navas' body. Legia may have been dreaming of a point against the 11-time European Cup champions but thoughts of an even better result were raised by Moulin's strike seven minutes from time. Some woeful Real defending saw Odjidja-Ofoe get in down the left with two options across from him, and substitute Aleksandar Prijovic collected the pass and teed up Moulin to blast in a third off the post. Legia's lead would last just two minutes, though, as Toni Kroos found Dani Carvajal inside the box and he back-heeled to Kovacic, who tucked away an equaliser into the corner. The Spanish side then almost claimed a winner with the last act of the game when substitute Lucas Vazquez smashed against the crossbar, but that would have been harsh on a Legia side that turned up in style in the absence of their fans. Real were unable to get the win which would have seen them qualify while Legia now cannot progress, though this result was certainly some consolation.